You might recognise me from the picture below (I'm the one with the sadistic grin in the background, a must for all physios btw!). The Food&Lycra team have been training hard in the build up to RTTB so following their questions I thought I'd put down a few of my thoughts on one of the contentious issues around running - stretching. Do you stretch? How long? When? How often? All of below is relevant for the uninjured athlete Remember "if you have a body, you're an athlete". A warm up with dynamic stretching before an activity is essential. It gets your body ready for action, the blood and oxygen flowing to the muscles. It helps you guard against injury by ensuring your body is ready for the 'fight'. Dynamic stretching is also known as active stretching, you're taking the muscles towards their end of range but not holding them there. Your dynamic stretching should imitate the movements you will do during your activity. Static stretching, the stuff you hold for a bit of time - I've heard anything from a few seconds up to five minutes! Should be done after your run. It helps your muscles recover so you're ready for the next session. Current research shows holding for between 30 to 60 seconds is the most effective. Anything less than that and you're not gaining an effective stretch and more than that you're losing the efficiency of the stretch. I would always time a stretch on your watch or phone. There are so many stretches out there, pick something you like to do and you feel is hitting the spot! So guys what do you do? Do you believe in stretching? Or are you too exhausted after your runs? Do you have a strict regime? Let me know your thoughts, I would love to hear from you. In a kneeling lunge position, tuck the pelvis under. Lean forwards until stretch is felt in the upper thigh. 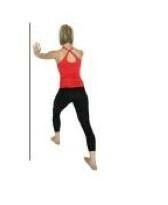 Stand on one leg with support if required for balance. Bend the opposite leg and hold the foot. Keep the knees close together and pull the heel directly to the bottom without twisting the leg. Starting on your hands and knees. 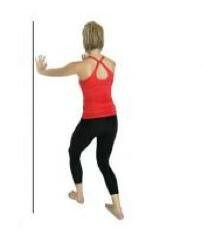 Slide the left leg along the floor and rotate the right lower leg so the foot moves towards the hands. Sit back onto the right leg to feel a stretch through the right buttock. Lie on your back, in a neutral spine position. Bring one leg to tabletop and hold behind the thigh as you slowly straighten the leg to reach the foot to the ceiling. Keep your tailbone on the floor. Stretch should be felt behind the leg, not in the lower back. Standing in a stride stance. Toes pointing forwards. Bend the front leg over the 2nd toe keeping the back leg straight and heel down. The stretch should be felt in the calf of the back leg. Hold for 30 seconds and repeat both sides. Stand with one leg forwards (in a step stance) Toes pointing straight ahead. Keep the back heel on the floor as you bend the back knee over the 2nd toe. Stretch should be felt in the lower calf and Achilles of the back leg. Tej also advised us that the foam roller should be our best friend and is great if you have problems with the IT Band. Advice all noted! If Adam Gemili manages to stretch for 10 minutes and foam rolls for 10 minutes after each sessions so should we. What's your favorite stretch? What do you do to help avoid injuries from running?